Exeter boss Rob Baxter says he has discussed the form of second row Mitch Lees with England coach Eddie Jones. Jones met Exeter's coaching staff this week for the first time. 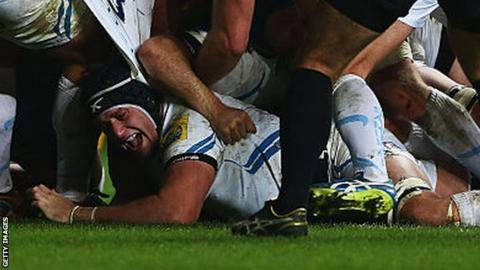 Australian-born Lees, who is eligible to play for England, has started all but one of Exeter's games this season. "He's been playing a big man's game in our side and doing it very well and I think there aren't that many players like that in the country at the moment," Baxter said. The 27-year-old Lees, who joined Exeter from London Welsh in April last year, has scored tries in each of the last two games and kept the likes of England international Geoff Parling out of the side. "He's probably been under the radar a little bit," added Baxter. "I believe in what you see with your own eyes and I think Mitch's actions speak louder than any words I can say about him." Baxter also discussed a number of his established internationals with Jones, who was in attendance last week as the Chiefs recorded a famous win over French Top 14 leaders Clermont Auvergne. Exeter have also got off to an impressive start in the Premiership, winning five of their opening six games, and sitting second in the table. "He was pretty impressed with where we stand in the table at the minute, the way we've been playing and we've had some good results," Baxter told BBC Sport. "It was a meeting about where things are going to with players. "There were no shocking revelations to me, he was just very easy to talk to, very straightforward, and talked a lot of common sense, which was the kind of thing we'd expect, and it was nice to hear. "The only message I can give to our lads is 'well done so far, you've obviously caught his eye with how you've been playing and the performances you've put in, but the important thing is to make sure you're the form player when the squad gets selected in a few weeks' time'."